Jay Rodriguez scored his first Premier League goal for more than two years during a pulsating last few minutes of the game. Saints had started really strongly for the first 15 minutes of the game, but the intervening bulk of the match saw them huff and puff and achieve the square root of damn all. It is clear that the team is struggling to get to grips with a new system, but the fans seem unable to agree amongst themselves exactly what the new system is. Is it a diamond formation, or is it 4-3-3, or 4-3-2-1? Whatever, it clearly demands more mobility than Charlie Austin has. Once he ran out of steam in the first 15 minutes, he was totally ineffective for the remainder of his time on the pitch. That apart, what really upset me was to hear mindless booing at the substitutions. Why you would boo the replacements of Tadić (who had a poor game, with loads of misplaced passes) for Long and Højbjerg (who was also having a less than stellar afternoon) for Ward-Prowse was beyond me. Both Long and Ward-Prowse went on to have good games and together with Jay Rodriguez, who had come on for the early exhausted Austin, really made a difference. Suddenly Saints had a cutting edge again. Going right back to before the start of the match, there was another example of Saints attempting new things to entertain. We have already seen the introduction of, while not exactly a marching band, was certainly a mobile band, taking me way back to the Albion Band and whatever the New Orleans style marching Jazz band was called that used to perform at the Dell. On Saturday we saw something new. A couple of blokes on Segways done up to look like those two wheeled shopping bags, so beloved of old ladies. They were in turn dressed as pantomime old ladies and looked as if they were sat on the said bags. From somewhere inside the contraptions they had a sound track playing of a revving V8 engine. You can see them in MatchDay Uncovered above at about 1'20''. What I wanted to see was a race off between them, it might have been a welcome change from the youngsters racing each other at half-time. Back to the game. From the kick-off Saints were all over Sunderland and looking good. The movement and passing was quick, crisp and effective. Austin was looking good and it seemed only a matter of time before Saints scored. Then on about 15 minutes the team seemed to lose their way. The Sunderland keeper, young Jordan Pickford, was looking assured and made a couple of good stops and some of the players in red & white stripes seemed suddenly unsure how to break them down. Cédric was a good example. He was sending wild shots in the rough direction of the Sunderland goal, but without any Saints player near. The generally boisterous support from the Saints fans began to quieten down and the mood changed to one of nervousness. It was a relief when half time came, but there were the sounds of dissent coming from the direction of the Northam. The second half started in the same manner as the first half finished. Puel eventually could stand it no more and pulled off the ineffective Tadić (who had one of his worst games for months) and sent on Shane Long. This didn't go down with some sections of the home 'support' who roundly booed this change. Shortly after the shattered Austin was taken off and Jay Rodriguez was sent on to huge cheers. He was looking well up for this. 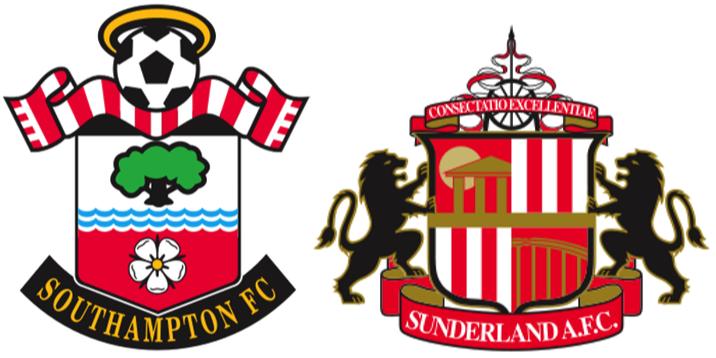 With about ten minutes left and in one of their rare effective attacks, Sunderland got the ball to Defoe who got into the penalty area and drew a foul from Fonte. Everyone knew what was coming and the referee Lee Mason, pointed to the spot. Defoe made no mistake, beating Forster, who had been a virtual spectator for the previous 80 minutes. The reaction from Puel was virtually instantaneous, hauling off Højbjerg to the fury of the same section of the 'fans' who took exception to Tadić going off. The Dane was replaced by Ward-Prowse, who had an immediate effect. Suddenly Saints were asking all the questions and the ball was pinging around the Sunderland penalty area, when it fell to Jay Rodriguez on the edge of the penalty area. He didn't strike it cleanly, but the young Sunderland goalie made a bit of a pig's ear of it and the ball squirmed under his body and into the net. 1-1. For the remainder of the game Saints poured forward in search of the winner, but it just didn't happen. I left the ground confused at the section of the Saints support that felt it necessary to boo the manager three games into the season. The daft thing is, that last season after three games, we had also drawn two and lost one. I don't remember any of this nonsense then. Granted the team is in transition and things are not quite right yet, but it will come. Unfortunately we now have the international break and then the games come thick and fast. There will not be much time to put things right then.